November 12th marked the first step in the State Library’s initiative to roll out STEM to Read across New Mexico. Beginning in Las Cruces, Early Literacy Consultant Saroj Ghoting delivered three workshops that focused on bringing science and math concepts to storytimes and museum programming. The training was packed full of information and ideas – everything from understanding how little minds work to what benefits their way of thinking the most. 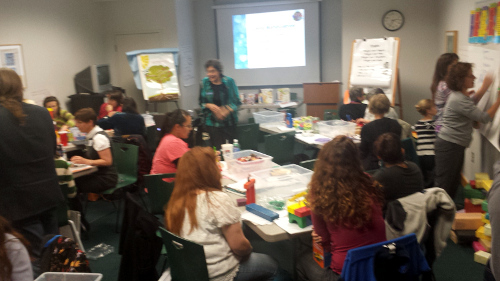 Incorporated in the workshop was how to use manipulatives and hands-on play in exploring science and math with early learners. That, of course, required all the librarians to play with, well, toys! You can use any book to explore science and math concepts with kids. Saroj instructed on the different content and process areas of science and math thinking for kids. Once you know these, you’ll realize they are in just about every story out there…even My Little Pony! You should put at least 1 informational text (nonfiction) book in every storytime for kids over the age of 2. As Saroj points out, you don’t have to read the whole book – but find a page or a section to read aloud and discuss with kids. This will encourage explorative thinking, build kids’ vocabularies, and encourage discussion. In my experience, nonfiction with little kids will encourage a lot of discussion…in fact, so much that reading an information text with a group of kids becomes more of an activity in a storytime, rather than another story. It’s also a great activity to model for parents. As librarians, we are already doing great things to point out science and math concepts in stories. But we can do more. By being aware of the content and process areas and by understanding the methods of exploring sci/math ideas with little kids, you will be explicit in your storytime planning and delivery. Your focus and awareness will pass on to your audience. Online video series with Saroj Ghoting – for those who could not make the live training and to refresh the thinking of those who did. Activity trunks…We hope to start circulating them to libraries early 2014! Stay tuned – there is a lot more to come!